Big Blue 600 Air Pak welder/generator. The new Big Blue 600 Air Pak welder/generator provides the reliability and versatility needed for field-based work that requires single-operator power for welding, carbon arc gouging, auxiliary power, or running an air compressor to perform critical repair and maintenance functions. Released by Miller Electric Mfg. Co., this 600 amp machine features a powerful EPA Tier 4 Final–compliant Deutz engine rated at 65.7 hp and is ideal for industrial applications including rail, mining, construction and fabrication. “Responding to a need in the marketplace, the Big Blue 600 Air Pak from Miller is the most reliable, versatile machine available in its class,” said Ben Froland, product manager for Miller Electric Mfg. 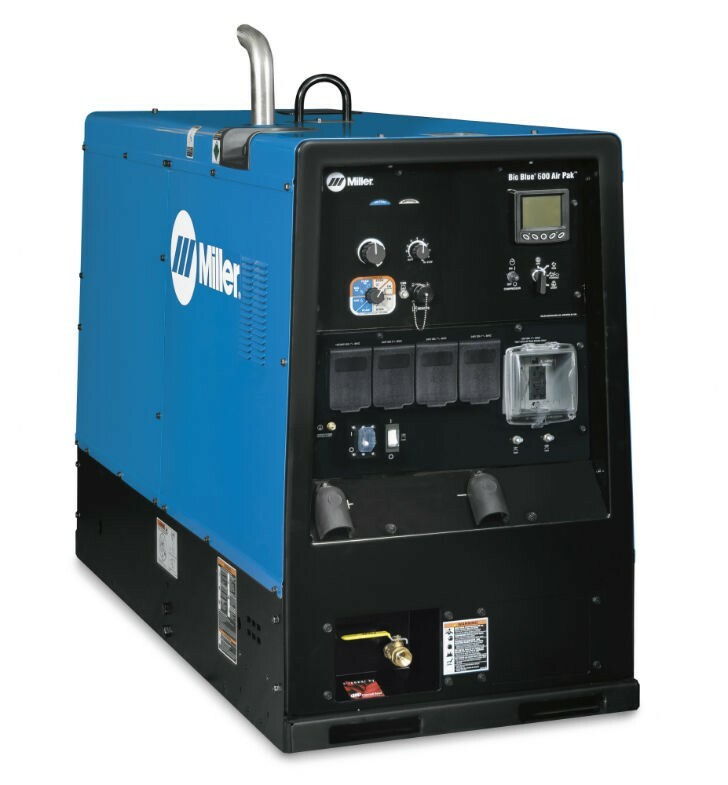 Co. “We know that jobsite demands vary greatly so Miller has expanded our welder/generator offering to ensure that no matter what your needs are, you can keep your worksite equipment fully functional – and your employees more productive throughout the day. This model features an Ingersoll Rand screw-type air compressor making it ideal for gouging. It also can operate a full range of pneumatic tools, supplying up to 60 cfm of air at 100 psi with a 100 percent duty cycle. In addition, the Big Blue 600 Air Pak provides several key upgrades from previous models, including improved arc characteristics, digital weld meters and display, and three-phase power available anytime – even while welding. A 4-inch electronic engine display replaces the traditional cluster of analog gauges. This display allows users to precisely monitor fuel level, engine hours, coolant temperature, oil pressure, battery voltage, air pressure and engine rpm – all in one convenient location. In addition, the display also tracks oil change intervals and displays engine diagnostics for quick and easy servicing.